From dreams to reality, Steve Jobs’ vision of putting twelve thousand people in one building is about to happen. Apple Park construction is nearly finish. This drone footage taken few days ago will show the latest progress and development of Apple‘s massive corporate headquarter. In the video, crews and workers can be seen working in the main ring building, underground tunnel as well as in landscaping. See below. 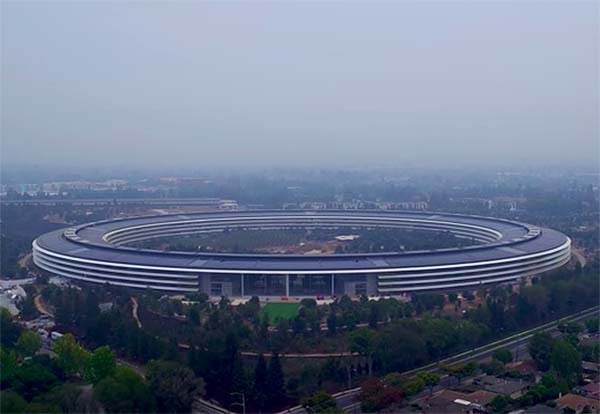 Located at the heart of Cupertino in California, the 2.8 million sq foot circular building is estimated to cost for about $5 billion dollar. It is projected to seat 12,000 employee. Apple Park amenities includes The Apple Cafe that can serve 4000 guests, 100,000 sq foot fitness center, two-story yoga room, 2 miles of walking and running path and Apple Store. While construction is still underway and deadline has been extended, Apple Park officially opened last April 2017. Just recently, Steve Jobs Theater made its public debut during the iPhone 8, iPhone X and Apple Watch announcement event on September 12, 2017.